Anyway, I would like to wish a “Very Merry Christmas” to all Seasaltwithfood readers and have a wonderful holiday! Equipment: An 8 Inch Square metal baking pan, the bottom and all sides lined with foil. Preheat the oven to 350˚F. Position a rack in the lower third of the oven. To make the crust: In a medium bowl, combine the melted butter with the sugar, vanilla, and salt. Add the flour and mix just until incorporated. Press the dough evenly over the bottom of the pan. Bake for 25 to 30 minutes, or until the crust is fully baked, well browned at the edges, and golden brown in the center. When the crust is ready, turn the oven down to 300˚F. Slide the rack with the pan out and pour the filling onto the hot crust. Bake for 20 to 25 minutes longer, or until the topping barely jiggles in the center when the pan is tapped. Set on a rack to cool completely in the pan. Lift up the foil liner and transfer the bars to a cutting board. If the surface is covered with a thin layer of moist foam (not unusual), you can blot it gently to reveal the zest by laying a square paper towel on the surface and gently sweeping your fingers over it to absorb excess moisture. Remove the paper towel and repeat with a fresh piece if necessary. Use a long sharp knife to cut into 16 (2 inches) or 25 daintier bars. Sift powdered sugar over the bars just before serving, if desired. Love lemon bars! Merry Christmas & Happy New Year to you and your family, Angie! The photos make my mouth water! I love lemon bars and appreciate the reminder to make a batch. Can't wait to try your recipe. I prefer vert tangy lemon bars rather than the sweet ones. Wishing you and your family A Merry Blessed Christmas and Happy New Year!! I'm at my in-laws' house right now and they have two lemon trees and two orange trees that are abounding with fruit right now! They will be sending us home with bags of both. 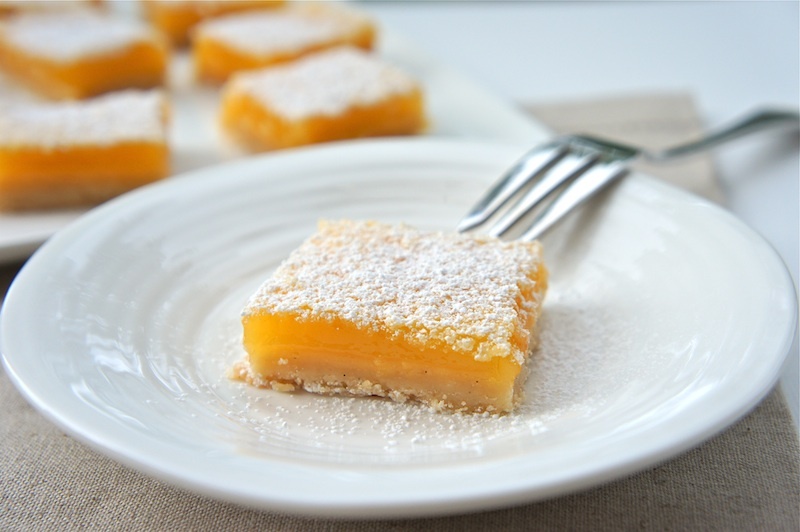 I am totally going to make these lemon bars, yum! I haven't made any of those in a few years now. Angie, the lemon bar looks tangy and good.Merry Christmas and Happy New Year to you and your family! You've just reminded me of another great Lemon bar recipe I had... Merry Christmas, Angie! Looking forward to see many many more lovely dishes from you in 2011! 1/2 cup of lemon juice in an 8" square! will definitely have to try these...look forward to the perfect pucker/sweet. thanks! delicious cake....have wonderful year ahead..n merry christmas...frst time here..lov all ur recipes...glad to follow u! 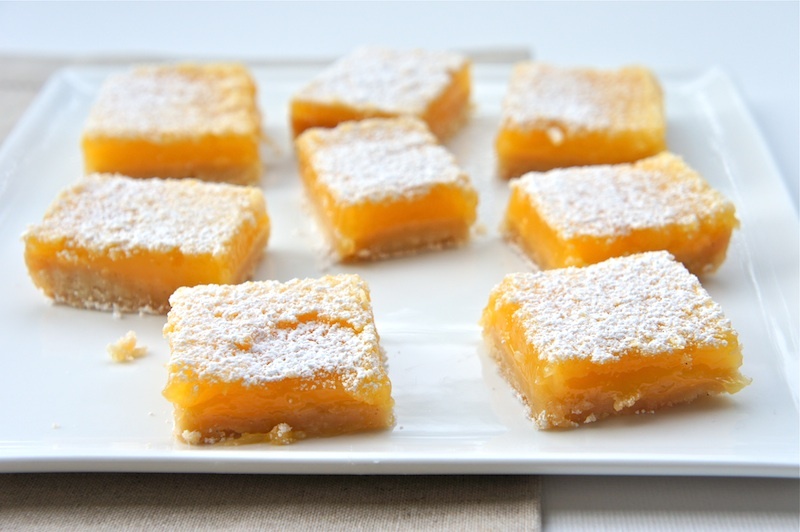 I love lemon bars and these look especially rich! Hi! I just discovered your blog via a thread on Ask Metafilter. I made these lemon bars tonight, and I think they are literally the best lemon bars i've ever had!! The crust was deliciously buttery, and these were the first ones I've had where i didn't wish they were more tart and lemony. @Deanna: That's great!Now,I have to make some too.